In the brief time that Amy Patterson has been a communications instructor at Moraine Park Technical College in Beaver Dam, her accomplishments have been impressive. For starters, she received the Outstanding New Instructor Award from the Wisconsin Association of Career and Technical Education this year. Last August she applied for (and was awarded) a grant that is helping her bring exciting study-abroad options and service-learning experiences to students at MPTC. This winter, thanks to the grant, she will accompany students to Jamaica where they will mingle and work with local residents, taking what they’ve learned in the classroom into the field for some experience-based learning in a developing country. Service projects might include nursing students overseeing blood pressure clinics or technical students building solar panels for clinics. “Once they are back home, students will reflect on the projects with the writing component,” Patterson said, noting they will create photo journals, use movie-making sources to create digital stories and perhaps even share their experiences on social media – as well as in their classrooms and local communities. Patterson’s students were already experiencing service-learning locally. As the advisor of the Multicultural Club on campus, Patterson helps club members become active with service projects in their communities —- experiences that help them apply the concepts they’ve learned in the classroom. One of her students, Scott Uttech of Beaver Dam, is an example. He was able to utilize communication skills he learned in Patterson’s classes when he spent time job-shadowing at the local hospital. “During that day of service learning, I worked with three case workers in the Social Services Department, and I asked a lot of questions,” Uttech said, noting the emphasis was on oral communication. He learned communication concepts first-hand by interacting with social services employees and patients. He dealt with patient evaluations, how to effectively communicate with specific patients, and also witnessed a meeting where all departments gathered to discuss patient outcomes and progress. Through her advisory role with the Multicultural Club on campus, Patterson meets students eager to discuss diversity – as it impacts locally and internationally. “Last year during one of our meetings, the students noted a desire for programming in the Caribbean — a location currently not represented through our International Education Department,” Patterson said. Shortly thereafter, she learned a grant was available that could make the students’ request a reality. “When Dr. Caron Daugherty, our Dean of General and International Education, shared the grant opportunity with faculty members at our college, I was excited about the possibility and eager to apply,” Patterson said, noting her own experiences of study abroad when she was in college helped her immensely. The grant awarded to Patterson last August through the U.S. Department of State and the Madison Area Technical College (Madison College) provides funding and training to develop new study abroad programs related to sustainable development in Central America and the Caribbean. It was designed to support the creation of new study abroad programs at community colleges in the target areas of engineering, renewable energy, sustainable development, technical education and related fields. As part of the grant requirements, participants are expected to develop a new study abroad course. While the grant creates new opportunities for MPTC students, it also allows Patterson to connect with other technical college educators and the Community College Sustainable Development Network — a partnership expected to include 24 institutions upon completion of the 2013 grant cycle. In this study abroad program, MPTC also partnered with the Blue Mountain Project (BMP), a non-profit organization established to promote clean water, health, literacy, and economic development in five rural villages in the District of Hagley Gap, Jamaica. Working directly with Jamaican residents, the Blue Mountain Project currently coordinates the efforts of U.S. volunteers working in Hagley Gap on community development projects and includes a partnership with Ripon College. The program Patterson will lead for students in 2014 will be located in this area of Jamaica. Patterson’s first international on-site training took place in January this year when she and other educators involved in the grant flew to rural Costa Rica for workshop training on renewable energy projects. 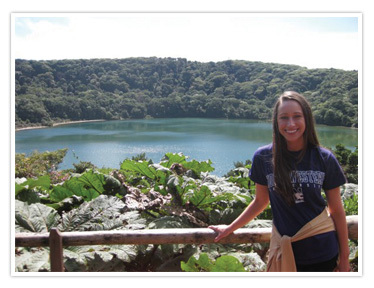 It gave her hands-on experience of projects MPTC students might be involved in next spring in Jamaica and other underdeveloped countries as the grant becomes the launching pad for additional international service projects and study-abroad opportunities. In Costa Rica, Patterson installed solar panels, worked on a biodigestor, and participated in innovative sustainable projects. It helped pave the way for encouraging her students to follow in her footsteps. Last spring, she traveled with other educators to Jamaica to preview the service-learning trip she will take there next spring with the students. Her lodging was in the home of a family living in the Jamaican mountains – a family who will also be overnight hosts to some of her students next year. The purpose was to ensure student safety and develop useful service projects students will conduct next year while there.